Welcome, this is episode 18 of the MudTalk Podcast. This is the one about time management. How do you balance your time? This is a great topic for a few reasons. First of all, as potters and ceramic artists, I think maybe it’s a little tougher for some of us than for other people with a more common 9 – 5 job. We have a lot more flexibility and freedom with our schedules. It’s also tough because we have to do so many different things. Sure, we get to play with clay… but what about the shows, the photography, the listing, the marketing, the ordering, the finances, and everything else? And some of us are trying to balance clay with another job! Another reason that I think it’s hard is because time in the studio seems to go so fast. I look down at the clay and all of a sudden a couple hours have passed! The best thing that makes this a great topic for this episode is that some people have really figured out what works for them and you get to hear some great ideas and helpful tips. But before that, just a reminder, this episode is “sponsored” by potteryshirts.com because we have a giveaway happening. That’s right, you could win a free T-shirt from potteryshirts.com as a thank you for listening. Make sure you listen to the end of the episode to hear details about how you can enter. But now, let us hear some thoughts from other clay people about time management. We’ll start with the comments from people that seem to be struggling and then we’ll hear from some of you that have started to figure out what works. 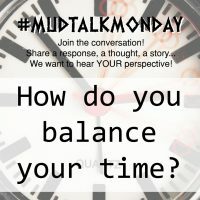 Next up, responding to How do you balance your time? GlynnisLessing So easy to go into the studio and not come out all day. Still struggling with balance! PathwayPottery I don’t balance very well! Feast or famine! QueerlyClay I’m supposed to balance my time? This response got me thinking. I guess nobody is forcing us to balance our time. So you don’t have to if you don’t want to. I suppose some people want, or need to, work on something for 4 days straight and then sleep for two days straight and then wake up and do something else. Some people probably don’t have a lot of close friends or family or are very introverted so they don’t worry about spending time with others. So there is no single right way to do this. But many people feel that it’s healthy or ideal to find a balance in their lives. You have to decide what is right for you. The next response covers a lot of topics along with time management. HarryChoePotter My goal in life is to be a potter and studio owner full time. How do you live off pottery? Not possible for me. I work full time and run a studio part time. Not enough time in the day or night. How do we stay happy? It’s tough trying to market your business and create art. In Korea, pottery seems like it’s a dead art. Schools don’t offer pottery anymore. It’s all diy based now. Artists can’t make a living just from selling art. What is balance? Just surviving is tough enough. I truly wish all artists the best of luck. I’m really happy to see artists succeed. Stay true to yourself. See love in people not hate. So it seems pretty clear to me, there are some people that really struggle with balancing their time. And that’s okay. It’s not easy. But the good news is that time management is something you can get better at. Next, we’ll here some tips and ideas that seem to be working for people. I love the positive vibe! When you’re working with clay, Mondays aren’t so bad! Anita R I make reasonable goals that I’d like to achieve for each week in order to stay on track and write them down and check them off as I complete them. Sometimes it works like a charm, other times life happens and you deal with it. I make lists of things to do in ceramics, family life, exercise, and include fun stuff on those lists to attempt balance. Whatever I don’t get to, I add it to the top of the following week’s list. Thanks Anita. I like to make a lot of lists for myself too. Mostly to remember what I need to get done. If I don’t write things down I often forget to do them. Just ask my wife. I also like making lists because when “life happens” as Anita says, I can come back and remember where I left off and get right back into it. Lists help me stay focused. After I write something on a list I don’t have to worry about remembering to do it. I can focus all my thoughts on the thing I’m doing at the moment. This response really resonates with me. I feel the same way a lot. If I don’t have a show coming up or a sales season, I don’t get into the clay studio nearly as much. That outside motivation really helps me get pots made. Not just because I want to play with my kids or watch Netflix all day, sometimes I just have a lot of other kinds of work that I want to do. Like a podcast, or a website. Outside motivation helps me prioritize things. Thanks Quigley Ceramics. Many potters talk about working in cycles. I think the long production process forces, or at least encourages this. For some it works really well to focus on one part of the process for a while and complete that part, then move on to the next part of the process. Once all the pots are made, or sold, you can start the next cycle. There are definitely some advantages to this. I generally work this way because I’m making pots for an upcoming event. But alas, I feel that I never have quite enough time in the clay studio so I have a variety of pots in different states of completion. This is actually a good thing though because sometimes I have just a little bit of time to work. So I may not have time to throw a dozen mugs but I may be able to glaze the inside of a dozen mugs in the time I have. In general though, it seems efficient to work in batches or cycles. Claybylaura This is a toughie! Hours pass in the studio in the blink of an eye. For me, I need to remember to get out of the studio, stay social, exercise and enjoy friends. All of it helps keep me happy and productive when I’m immersed in the clay. Very good point Laura. Take care of yourself first and it will help you do your best work when it’s time to work. Bridgespottery I am a full time studio potter. I teach one to two mornings a week at a local studio. To balance my time I map out my week(s) on a calendar just like project management. Time dedicated to making,marketing and admin, as well as fun, off the grid clay time with no pressure. Then I balance work with home and family just like any other working person does. Like the accountant, I have busy seasons where I work early and late. It is a juggling act. I have a husband, kids in HS and animals that fight for attention. Everyone feels like they are dfl sometimes, some more than others. Well said Bridges Pottery. After a little google search, I think DFL means dead freakin’ last. But anyway, the main takeaways from this response are fantastic. A lot of people plan their schedule week by week but the key word is plan. With all the different things that potters have to do, it’s a good idea to plan all the things. Even the “non essential” things like exercise, quality time with others, and time to play or explore. Those things may not be essential to your next deadline but they are essential to YOU. Making pots isn’t like a lot of other jobs but you can still treat it as a full time job and balance it with the other parts of your life. PigeonRoadPottery I’m a full time potter. I tend to work in the studio most days from 9 to 6 with an hour break for lunch. Some days I am more disciplined than others but for the most part I treat it like a job. I only work in the studio at night when I am under deadline but I regularly do marketing and business stuff in the evenings. I also teach a class at night once a week. If I need to schedule an appointment during the day I try to make it either at the beginning or end of the work day so I can get at least 6 hours of work in. I take one full day a week off to do things with friends. It’s nice to have a flexible schedule and the freedom to make my own hours. I love this response from Pigeon Road Pottery as well. Again, if making pots is your job, treat it as a job. I also like how getting into a routine can make things easier to balance your time. And making time for friends is important. It can be easy to isolate yourself if you do nothing but work in your studio. Awesome responses everyone! This is the kind of discussion that I was hoping for with the MudTalk Mondays. And it’s one of the main reasons I started Expert Clay, and even this podcast. We can explore an issue, maybe admit that we struggle with it, let other people offer some advice and tell what works for them, everyone gets better and our community gets stronger. I’m not saying this is the first great discussion we’ve had but it is a great example of what we can do as a community. So thank you to everyone who participated. I don’t expect to live 104 years but even if I come to an unexpected and early demise, would it really matter that I didn’t get 12 more mugs made this week or learned a new technique or got my work into that gallery? I mean, there’s something to be said about your legacy, but if my life is much shorter than I’m expecting hope, I want people to see that I cared about my family first and then cared about my work. So maybe I’m just trying to say, don’t put too much pressure on yourself. But it’s also, well, a balance to determine what kind of pressure you can stand and how important it is for you to grow or accomplish certain things. Maybe that’s the real question. What do you really want to accomplish in life? It’s all about priorities. If you really get things prioritized, it would probably be a lot easier to devote enough time to your most important things. I have one other thought about managing time but I can’t remember where I heard it. It’s not my original thought but I really agree with it. “Balance doesn’t always mean equal.” Or it doesn’t mean everything is equal. For example, say you have a box full of clay and a box of styrofoam packing peanuts. If the boxes are the same size the clay is going to weigh a lot more. To make them weigh the same you would need a lot more packing peanuts. When we’re talking about time, you shouldn’t feel like you have to spend an equal amount of time on each part of your life. You can try, but that is going to be tough to do. Instead, think about the quality of time you spend. Do you think my kids would rather spend 2 hours with me while I work on my laptop or 30 minutes that I focus completely on them? Of course I want to spend more than 30 minutes a day with my kids but I can schedule in at least 30 minutes where they get to pick what we do and have my full attention. And of course on weekends we have opportunities to have much bigger chunks of family time. You just have to decide what “balance” means. One last resource I have for you: if you haven’t been over to the Expert Clay Blog, go check that out at your earliest convenience. 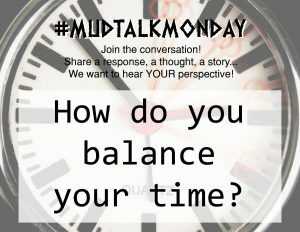 I’ve written some articles that have come straight from MudTalk Monday conversations. In fact, I have a whole series of articles about how you can make the most of your time in the studio. There are definitely some ideas in there that may help you balance your time. And finally, if you haven’t heard, or you forgot, we have a giveaway going on right now until the end of 2018. One winner will get to choose a free T shirt from potteryshirts.com. You can enter two ways. First, fill out a quick survey about potteryshirts.com. It should take 2 minutes at the most. Second, leave a comment or message at expertclay.com/mtp. It could be an idea for the MudTalk Podcast, or a response to one of the topics. It could be your favorite thing that you’ve heard on the show or a question about the show or myself. It could even be something you are trying to get better at yourself or a recent accomplishment. For more details about the giveaway and links to the entries, go to expertclay.com/giveaway. Remember, you can enter both ways to double your chances and currently you have pretty good odds because there haven’t been a lot of entries yet. Feel free to tell others about the podcast as well, especially if they would be interested in winning a free shirt. And thank you all so much for your participation and support. That pretty much wraps up episode 18 of the MudTalk Podcast. Be sure to subscribe with your favorite podcast subscription service. Look for the next episode sometime in the last half of December. As we start looking toward 2019, we’ll have episode 19 about what you would be doing if you weren’t working with clay. So until then, I hope you have all the time you need. Thanks for tuning in and stay muddy.